If you're looking for a quality e-cigarette starter kit that isn't overpriced, then you might want to take a look at the V2 Cigs starter kits. Truth be told, there are countless e-cigarette starter kits to choose from these days. Some cost too much, and some just aren't up to snuff in the quality department. But when it comes to V2 Cigs, you won't have to worry. They're widely known for their quality and customer satisfaction. In addition, they offer a Lifetime Warranty on their products, so should something ever go wrong, you're covered. And that's a good thing to know as a consumer. As for e-cigarette starter kits, V2 Cigs does offer several different types. But for this review, I'm going to focus on the V2 Standard Kit starter kit. For starters, the V2 Cigs Standard Kit comes with everything you need start vaping right away, and thus, giving you an alternative to smoking those nasty tobacco cigarettes. The kit also comes with the V2 Smart Charger (a USB charger). The Smart Charger has an internal chip that charges your e-cigarette battery twice as fast, and also prevents overcharging. One particular highlight of the V2 Cigs Standard starter kit is the Smart Charger (USB charger) that also comes with it. Since the V2 Smart Charger is a USB charger, it'll allow you to charge your e-cigarette via any standard USB port. So yeah, this allows your to charge your e-cigarette with your desktop computer, laptop, Xbox, PlayStation 3, etc. If it's got a standard USB port, it'll charge your e-cigs. And that's pretty damn handy. Vapor production of the V2 Standard starter kit is excellent. It produced a nice, thick cloud of vapor, with no effort at all. So you can expect a really nice "throat hit" with it. But also with no harshness to speak of. All in all, it's really smooth and enjoyable, which is just what we've come to expect from V2 Cigs. Anything else, and we'd be really taken aback (and pretty pissed). Honestly, there's no question about quality in regard to the V2 Standard Kit. It's all top-notch, right down to the batteries, and the chargers themselves. Our only wish is that they offer a few more vaping flavors (like Volcanoecigs does). 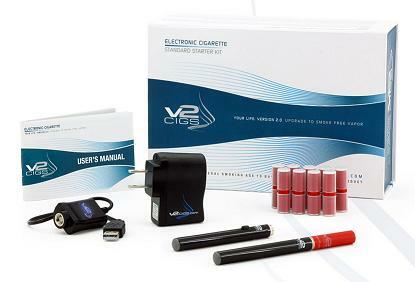 As for warranty, the V2 Standard Kit starter kit comes with the V2 Cigs Lifetime Warranty. The V2 Cigs Lifetime Warranty protects you from any product defects and whatnot for the full life of your V2 Cigs product. As a consumer, a good, solid warranty is very important, and V2 Cigs offers the best one out there today. Another thing we like about the V2 Standard Kit starter kit are the options you have when ordering. First off, you can select up to two different cartridge flavors, and choose which nicotine strength you want. You also have several different battery color options from which to choose, both for your automatic battery and for your manual battery (both of which are KR808D-1 threaded, btw). When you order your V2 Cigs starter kit (whichever one it may be) you can choose which cartridge flavor or flavors you want to vape on. The packaging itself is nice and tidy. It's clean and attractive, but it's also nothing to really write home about. Don't get me wrong; it's not bad at all. In fact, it's better than most. But it could be better. It needs a little more flare, a little more personality. And perhaps, a bit more color and vibrancy. It's a bit medicinal-looking, in my opinion. Then again, it's just packaging, no so biggie. One very important area in which V2 Cigs has excelled is in the area of safety, freshness and tamper prevention. Undoubtedly, they lead the pack when it comes to such things. In fact, all V2 flavor cartridges, e-liquid, express kits and disposable e-cigarettes come with expiration dates (so you'll know for sure that your stuff is fresh). In addition, the V2 flavor cartridges are individually sealed in foil-protected blister packaging. This prolongs the life of your cartridges, and also protects them from tampering. Another benefit you'll get by choosing V2 Cigs is the availability of live batch testing safety reports, which are available to all V2 Cigs customers for free via email. Batch safety test reports offer you a way of knowing exactly what's in your e-liquid and/or flavor cartridges, so you can rest assured that you have noting to worry about. This is a revolutionary change in the e-cigarette industry, much thanks to V2 Cigs. Hopefully other e-cig manufacturers and brands will follow this important example. But right now, as far as we know, no other e-cigarette company will send you e-liquid and cartridge batch test reports to your email address for free upon request. Shipping speed is really good. Orders generally arrive within 3 days or so (with the $5 flat rate shipping option). Other companies seem to take a bit longer, and some take way longer. Keep in mind that weekend orders will usually take a couple extra days. V2 Cigs offers several different choices when it comes to shipping your e-cigarette starter kit to you, including $5 flat rate shipping, and free shipping on all order over $200. Shipping options are via USPS (United States Postal Office) or UPS. To check the status of your order, all you have to do is log in to your V2 Cigs account. You can also track your order directly by using the tracking number they sent you when the shipment was made. When all is said and done, the V2 Standard Kit e-cigarette starter kit is no doubt a very strong buy. When compared to the numerous other e-cigarette starter kits out there, there's no doubt that the V2 standard Kit (with its Lifetime Warranty) is an excellent choice. Vapor production: Excellent. Smooth and thick. Product Quality: Excellent. Above most others. Reliability: Excellent. No fails at all. Batch Testing: Yes. Free via email. In summation, you can't go wrong with a V2 Standard Kit starter kit. It really is a great product all around. So check it out today and see what you think. Want 10% Off Any Purchase At V2 Cigs? • V2 Cigs Ultimate Starter Kit Review - And New Lower Price! Funny you should mention charging it with the USB port on the PS3. My cousin had a different brand with the USB Wall Charger/USB Passthru and actually used an extension cord from 3 rooms away while he was waiting for the batteries to charge.. One of the funniest things I've seen. And agree that V2 Cigs is a great product.